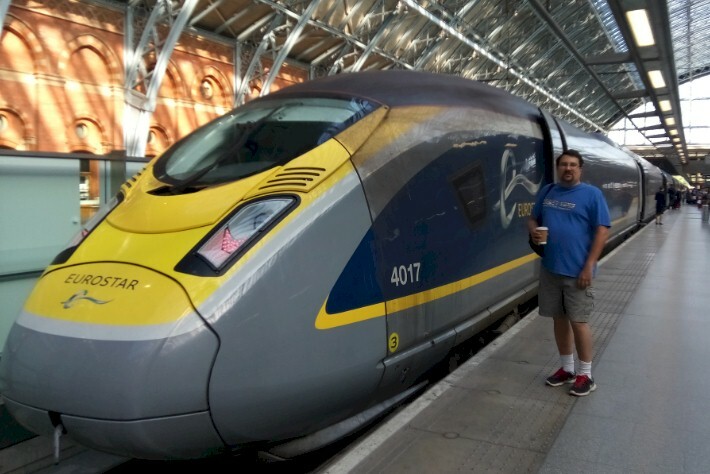 This month's article will focus on the Eurostar, a service we rode between London's Saint Pancras-International Station and Paris' Gare du Nord Station. We had quite the dilemma on our hands when planning out this trip to England. On one hand... we only had a total of three nights and four days total in London (because we wanted to spend a full week of the trip up in Scotland)... meaning we wanted to see as much of the city as possible. On the other hand... this was our first trip to Europe and we were not sure when we would ever have to opportunity to go back. With that being said... we made the decision to spend one of those days in London doing a 'day trip' over to Paris. Yes, I said a 'day trip' between London and Paris! 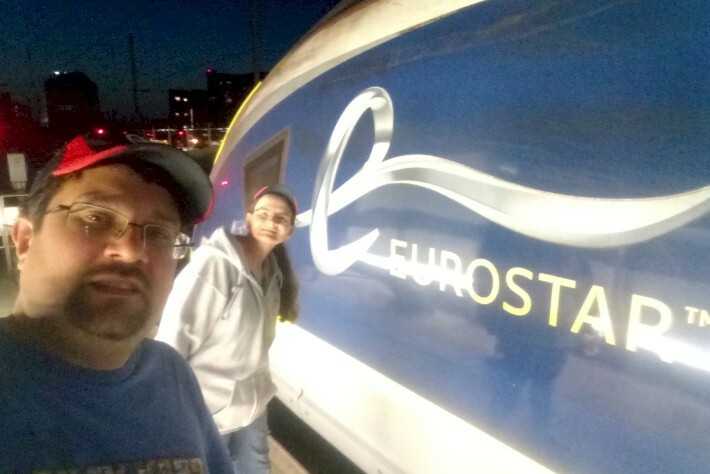 I don't think a lot of Americans realize how close the two cities (and countries) are to one another -- especially being linked by amazing, fast train service provided by Eurostar. 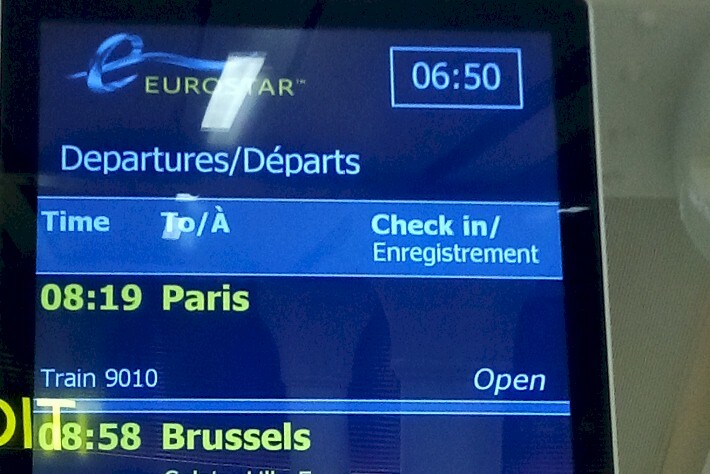 The run time for the Eurostar between London and Paris is about 2 hours and 15 minutes. That is just about 45 minutes longer than the trip on Amtrak's Hiawatha Service trains between Chicago and Milwaukee. You can't even get between Chicago and Illinois' Capital City of Springfield in that amount of time on one of the Lincoln Service trains. Of course, the highlight of the journey is passing through what has affectionately been known as the "Chunnel"... the important tunnel link used by Eurostar underneath the English Channel linking France (and mainland Europe) with Great Britain. The history of Eurostar can be traced to the 1986 choice of a rail tunnel to provide a cross-channel link between Britain and France. A previous attempt at constructing a tunnel between the two nations had begun in 1974, but was quickly aborted. 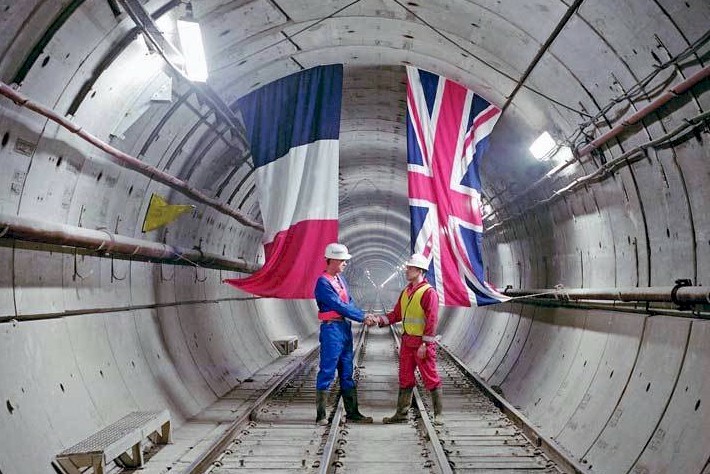 In 1988, plans for the Channel Tunnel finally got underway between Britain and France, in what was meant to be a non-publicly funded project. The 31.37 mile track, 164 feet below the surface of the water, was completed six years (in 1994), 13,000 workers and 11 large laser-guided drills later. The tunnel was officially opened by British sovereign Queen Elizabeth II and the French President Fran�ois Mitterrand at a ceremony in Calais on May 6, 1994. On November 14, 1994, Eurostar services began with limited service between Waterloo International Station in London, Gare du Nord Station in Paris, and Brussels-South Railway Station in Brussels. Full daily service started up on May 28, 1995. The following year, in 1996, the American Society of Civil Engineers identified the tunnel as one of the Seven Wonders of the Modern World. 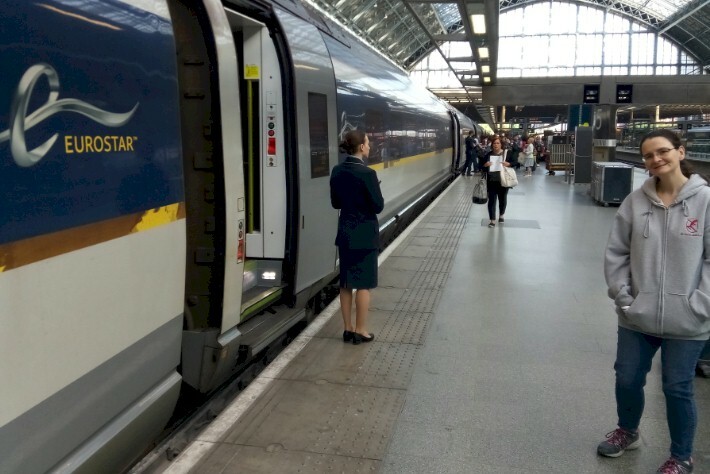 So just how fast does Eurostar service go? 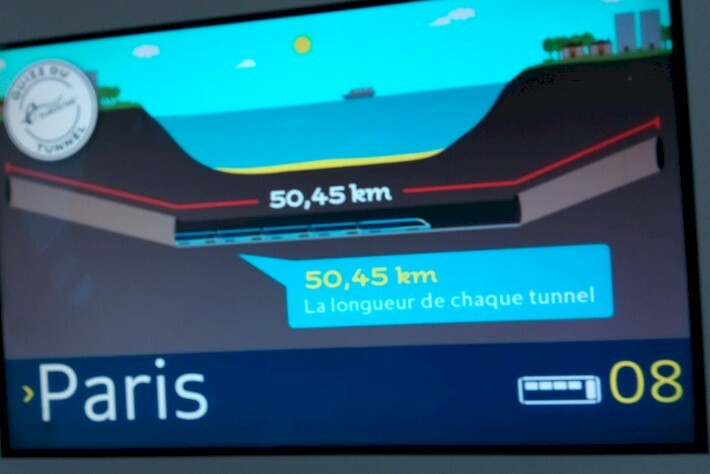 Along the current route, line speeds are set at 186 mph... except within the Channel Tunnel, where a reduced speed of 100 mph applies for safety reasons. This is a whopping 36 mph faster than any passenger train is allowed to go in the United States (Amtrak's Acela trains on the Northeast Corridor go up to 150 mph and only in small stretches)! 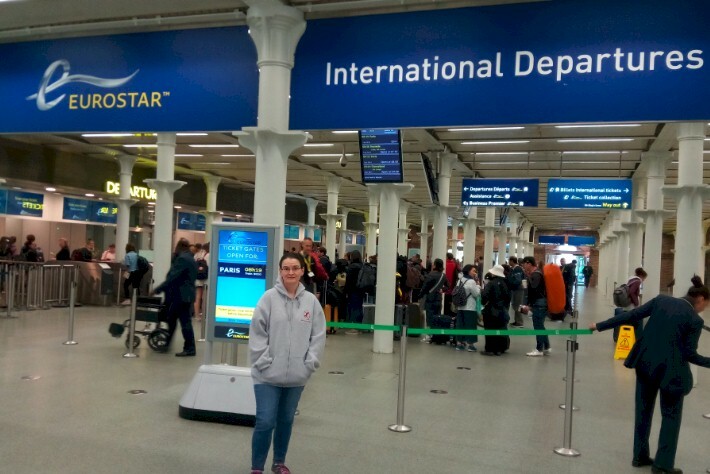 Eurostar offers up to sixteen weekday London – Paris services (eighteen on Fridays) including ten non-stop (twelve on Fridays). In addition, there is a return trip from London to Marne-la-Vall�e - Chessy for Disneyland Paris which runs at least four times a week with increased frequency during school holidays and an up to five times a week service to Marseille via Lyon and Avignon. There are also seasonal services in the winter. "Snow trains", aimed at skiers, to Bourg-Saint-Maurice, Aime-la-Plagne and Mo�tiers in the Alps; these run twice-weekly, one overnight and one during the daytime. Intermediate stations are Ebbsfleet International in northwest Kent (we passed through here 14 minutes after leaving London), Ashford International in southeast Kent (we passed through here 29 minutes after leaving London), and Calais-Fr�thun and Lille-Europe in Nord-Pas-de-Calais. 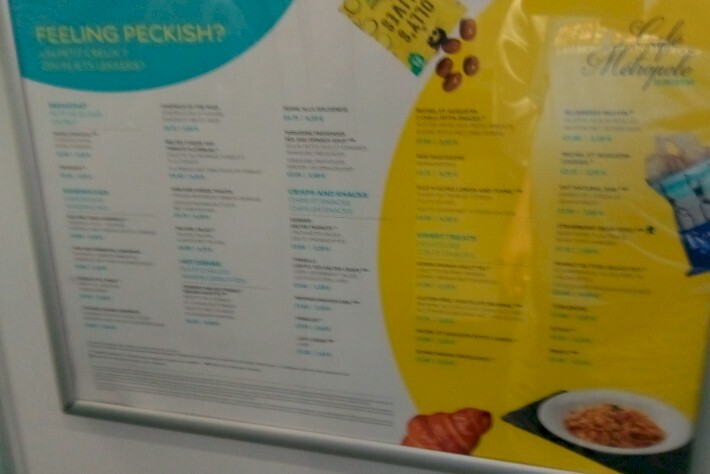 We found the prices on the Eurostar to be quite reasonable. We were told that Eurostar's fares were significantly higher in its early years; the cheapest fare in 1994 was �99 return. In 2002, Eurostar was planning cheaper fares, an example of which was an offer of �50 day returns from London to Paris or Brussels. By March 2003, the cheapest fare from the UK was �59 return, available all year around. In June 2009 it was announced that one-way single fares would be available at �31 at the cheapest. 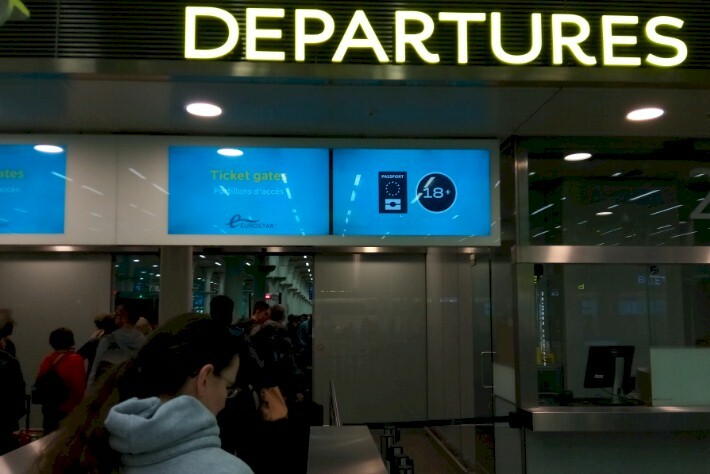 Competition between Eurostar and airline services was a large factor in ticket prices being reduced from the initial levels. Business Premier fares also slightly undercut air fares on similar routes, targeted at regular business travelers. In 2009, Eurostar greatly increased its budget ticket availability to help maintain and grow its dominant market share. 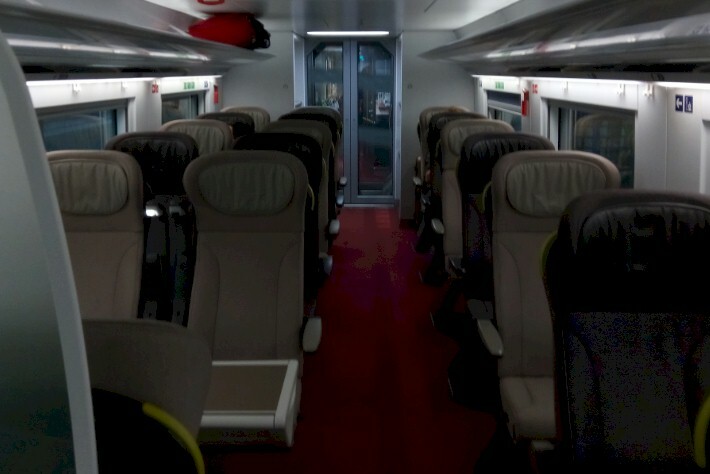 First class on Eurostar is called Business Premier; benefits include guaranteed faster checking-in and meals served at-seat, as well as the improved furnishings and interior of Business Premier carriages. 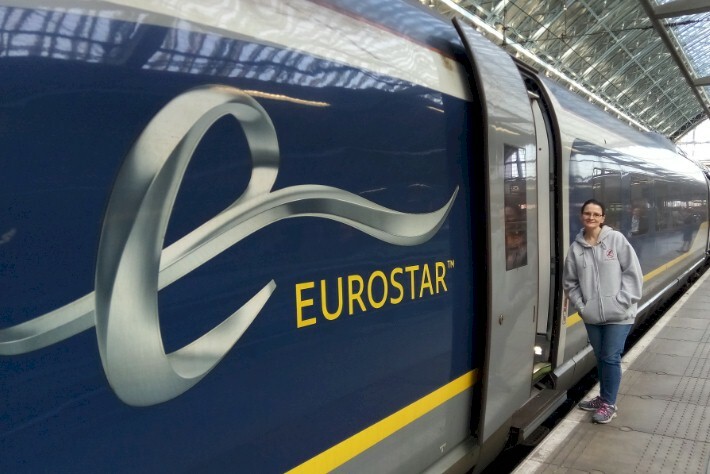 The re branding is part of Eurostar's marketing drive to attract more business professionals. 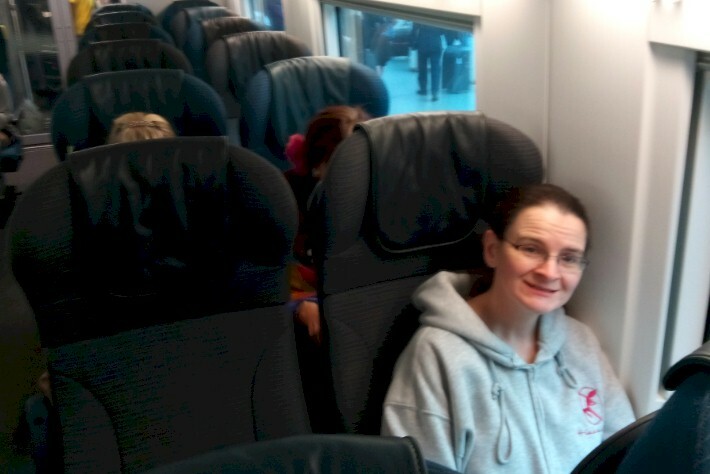 Between London and Paris we rode on in Standard Class... but on the return... we opted to upgrade to Premier Class. We will have a review of both classes for you below --- and we'll tell you if we think it's worth the upgrade or not when you visit London and Paris. 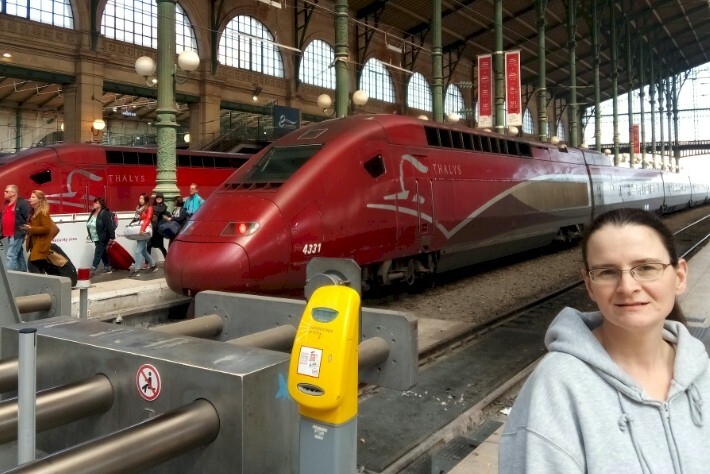 For the most part, the remainder of our TrainWeb blog post here on out will be a step-by-step guide on how to easily do a Paris day-trip if you ever find yourself in London and wanting to get away and see another country for the day. 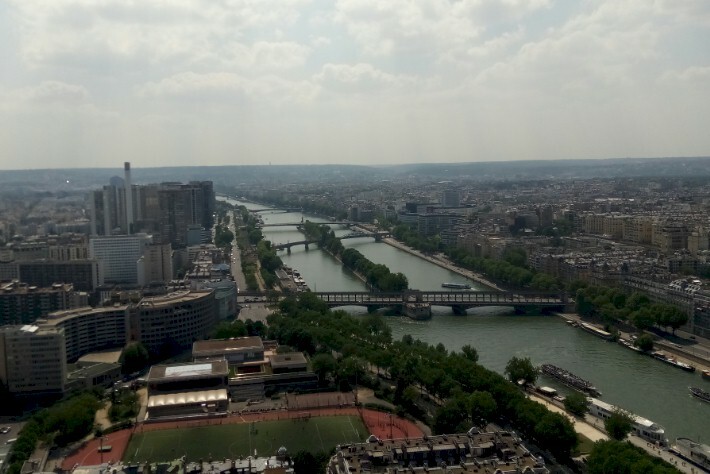 By following our itinerary, you will have enough time for the round-trip ride on Eurostar, plus time for a memorable lunch at a sidewalk cafe in Paris, time to ride to the top of the Eiffel Tower, and a time even for a leisurely stroll along the Seine River in Paris back to catch your outbound train back to London. Before we begin with the train ride on Eurostar... Our first recommendation is getting your Eiffel Tower tickets EARLY! They go quick. Even though we got our passes to the top the day they went on sale (generally three months out)... we still had to wait in line for over an hour to reach the top. Travelers who showed up without advance tickets spent three hours in line just to get up to the observation platform that was not even half of the way to the top. 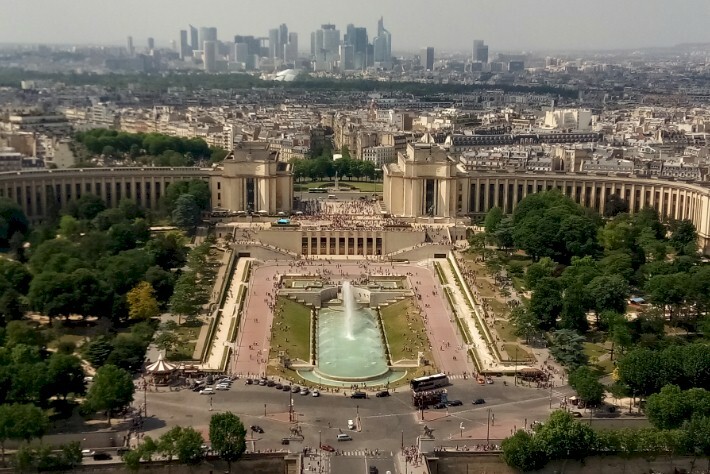 So if it's your goal to go all the way to the top of the Eiffel Tower... hop on their website soon after tickets go on sale and still pack your patience. We had timed 3:00pm passes for the top, but again, didn't really make it up there until after 4:00pm with the massive lines. And... this way May... which was still the "fringe" busy season for Paris. Anyway, on to our itinerary. 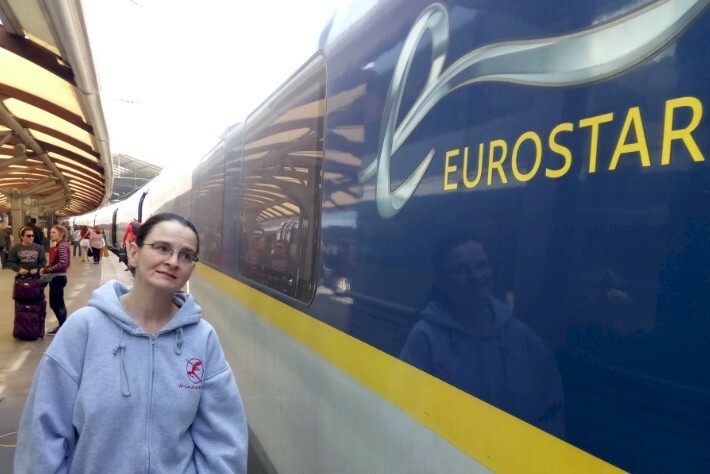 I wanted to mention that we noticed there were a number of tour companies in London offering the Paris day-trip on Eurostar as part of one of their tour packages. 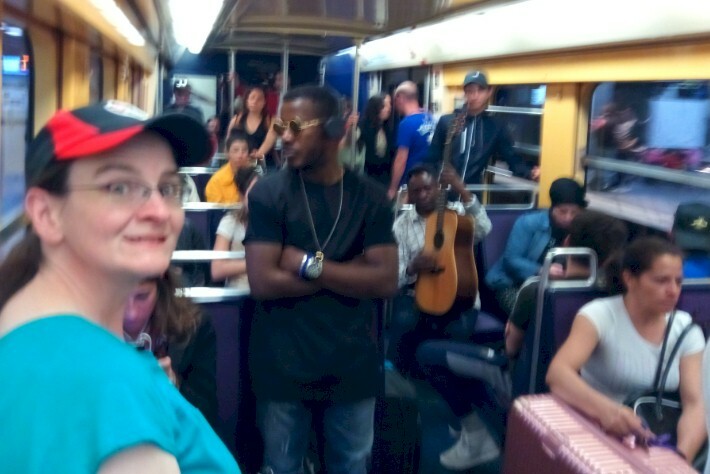 For this, you get a tour director who rides with you on the train (or in some cases, you're on your own on the train and then the tour director meets you in Paris when you get off the train) and then you get a guided tour of Paris for the day. Most of the packages only offered Eiffel Tower tickets that didn't go all the way to the top... which is something we wanted to do. We also felt planning the trip ourselves was half the fun of the experience. And as we learned... there is no need to pay the marked-up prices of the tour companies unless you are uneasy about traveling in a new city. 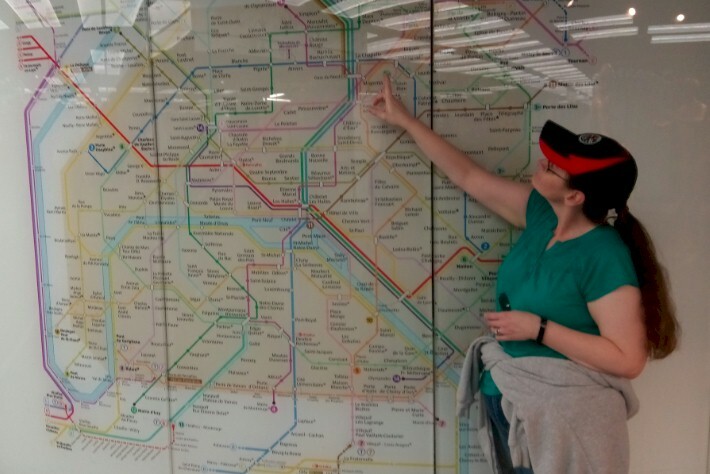 At least for us, it was very easy to book Eurostar yourself and navigate your way around Paris to the major landmarks. We also did consider booking everything ourselves and then maybe using the Big Bus Paris to do a guided tour of the city, but again, this is probably the only time we will ever be in Paris... and wanted this to be a more intimate experience (even if it was going to mean getting lost once or twice) than sitting on a bus with a bunch of other people for the day. The day that made the most sense for us to do the day-trip on Eurostar between London and Paris was on Sunday, May 20th. There are some pro's and con's with booking your trip on a Sunday. Our strategy was we were hoping the train would have a light passenger load since most business people travel on weekdays... plus maybe there would be a lot less traffic and people out and about on a day that was not a business/work day. The downside is the first trip out of London on Sunday doesn't leave until 8:19am. If we went on a weekday, we could have caught a train leaving London as early as 5:40am. So think about that when you are booking your experience. Going on a Sunday the crowds are a lot lighter in both London and Paris... and somewhat on the train... but you are trading that off for potentially two to three hours less time in Paris, too. 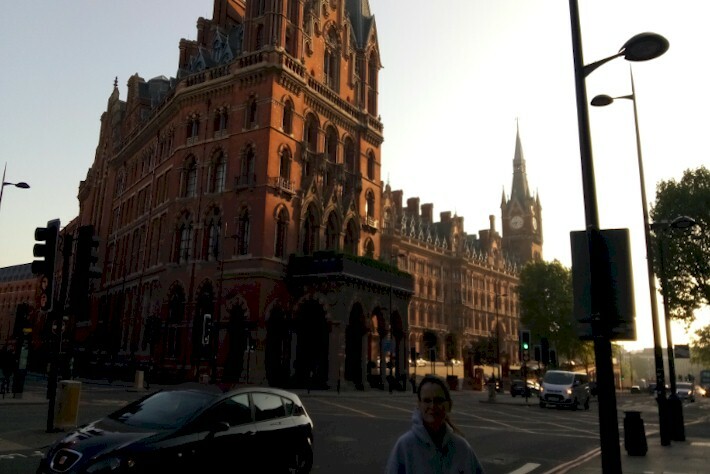 London's historic Saint Pancras Station was just a few blocks from our hotel... so we just walked over and got there around 6:45am. Paris bound on the Eurostar! 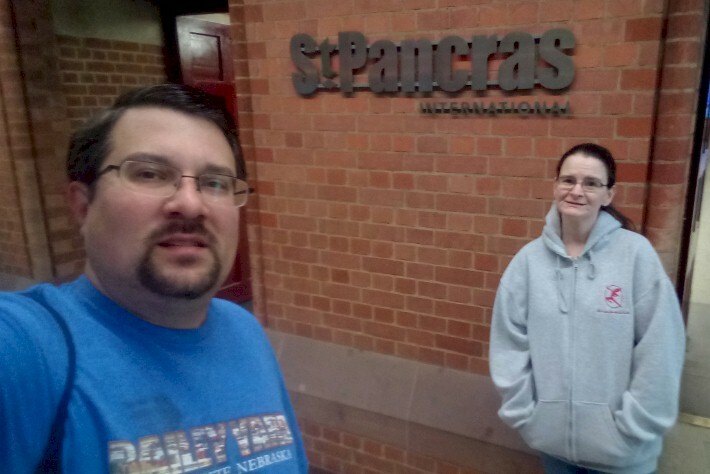 Authors Robert and Kandace Tabern begin their journey at Saint Pancras Station in London. St. Pancras Station was built by the Midland Railway Company (MRC) to connect London with some of England’s major cities. It was intended to make a grand statement about the Company with a display of physical magnificence. To assist them in this they appointed engineers William Henry Barlow, chief engineer (MRC) and Roland Mason Ordish who were responsible for the train shed and the overall layout of the site; and George Gilbert Scott, as architect for the hotel and station accommodation which was completed in 1876. The roof is made up of a series of wrought iron ribs resulting in a space 100-feet high, 240-feet wide and 700-feet long. It was the largest single spanned roof in the world when first built, and its design was copied across the world, including at Grand Central Station in New York. The roof trusses form a pointed arch which is complemented beautifully by the architecture of the hotel. In the 19th Century, St. Pancras was one of the most important gateways into London. On opening it provided services to Manchester, Liverpool, Leeds and Bradford and from 1876 the station offered services all the way up to Edinburgh. In June 1874 the first Pullman service in the UK with restaurant car and sleeping accommodation, left the station, running initially to Bedford and by 1878 all the way to Wick at the northern tip of Scotland. This was the first time ever that meals were served to passengers on a train. A bright new future for the station emerged in 1993 when the government decided to plan a high speed route for Channel Tunnel trains running from Dover to London via Stratford, and ending at St Pancras. In order to convert the station for use by modern international trains the station had to be doubled in length, and an additional six new platforms were needed to serve both international and domestic trains at the same time. To preserve Scott and Barlow’s original design a wholly separate extension was constructed in concrete, glass and steel. The renewal of the Station took three years, from 2004 – 2007, and followed a rigorous and painstaking and process of conservation. The newly restored Station was opened by the Queen in November 2007 at an opening concert performed by the Royal Philharmonic Concert Orchestra. 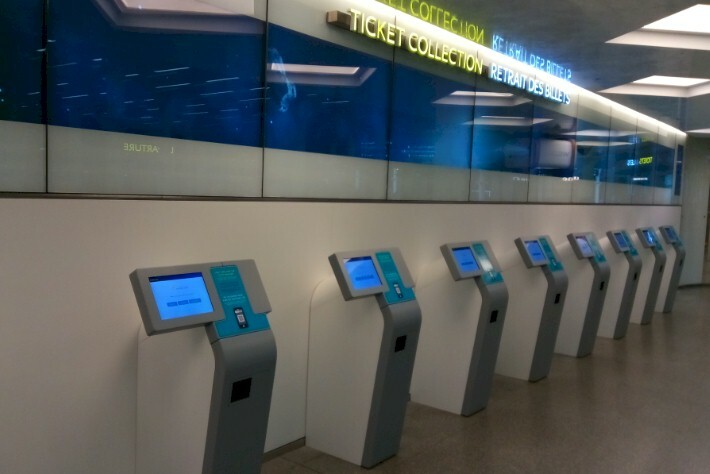 Arriving at the station, you get your tickets from the kiosks if you have not printed them at home and head to the International Boarding area. Right on time! Check-in was already open for our 8:19am train to Paris. "Checking-in" basically involves involves scanning your boarding pass -- and then an automatic gate opens that lets you into the security/boarding crossing area. Note that Eurostar runs to trains to both Paris and Brussels. The trip to Brussels is even shorter than the ride to Paris -- so you could also do a day-trip to Eurostar to Belgium. Maybe we'll do that too on our next trip! But, Paris just had more appeal to us. Maybe because the UK is still part of the European Union still, the boarding process and security was very quick and efficient. 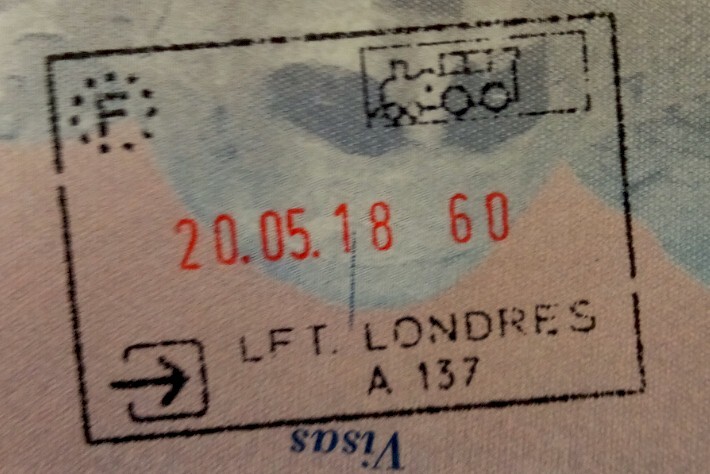 We even got a passport stamp that had a train on it... never seen anything like this anywhere else before! What was nice about the security process is that we were pre-cleared by French border patrol authorities in London... meaning when we arrived in Paris we were free to get off the train and go about our business without any delays. A train on our passport! We got this after being cleared by French border patrol. Once you clear security, you enter a large waiting room at St. Pancras Station that does have several food options. Getting to the station at 6:45am for the 8:19am train was almost a little too early; we still had plenty of time to grab something to eat at one of the cafes off the large waiting room. 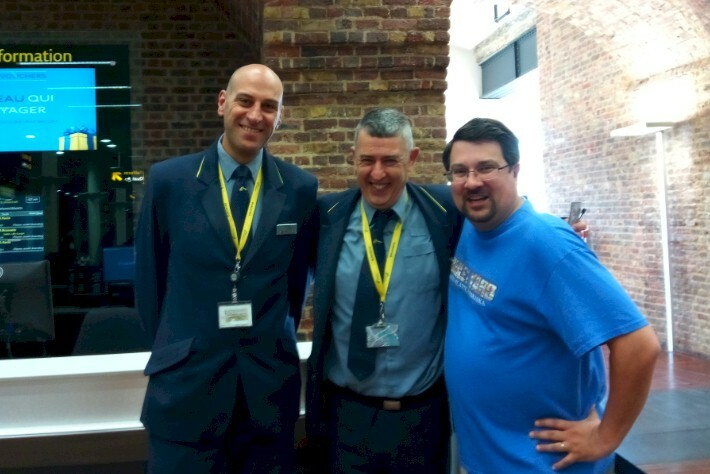 We also had some very nice conversations with the friendly Eurostar staff before it was time for departure. We were not sure what the food selection was going to be like on the train... but this is a good option too if you choose to run a little later than we did. Departure Time! Kandace... with coffee in hand... prepares to head up the moving sidewalks up to the train. Let's take a quick minute to break down the classes and fares of Eurostar. When booking, you have basically three choices of service --- Standard, Standard Premier, and Business Premier. Standard Class is the most economical choice... seats are in rows of 2 by 2... and this comes with no food options included (you have to go and buy something in the cafe if you want it). We decided to book this option going between London and Paris for our trip to see what it would be like. A ticket in Standard Class for our trip cost around $99 USD per person one-way. Standard Premier includes more leg room (including some 1 by 1 seats) and a light meal served at your seat. 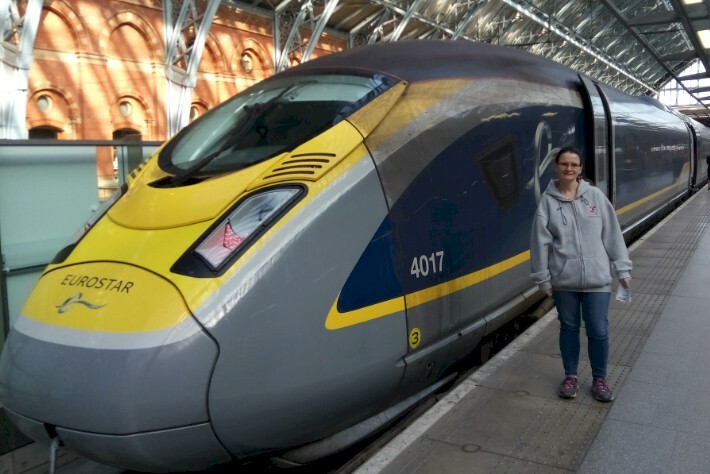 We booked this class for the return journey from Paris to London (a little later we'll tell you if we think it was worth the upgrade or not!). A ticket in Standard Premier for our trip cost around $131 USD per person one-way. The highest class you can book is Business Premier which includes a hot meal with champagne and access to the First Class lounges in London and Paris. If we opted for this, it would have cost around $325 USD per person one-way. Note that much like train trips on Amtrak... prices do vary greatly on when you book and availability on the train. 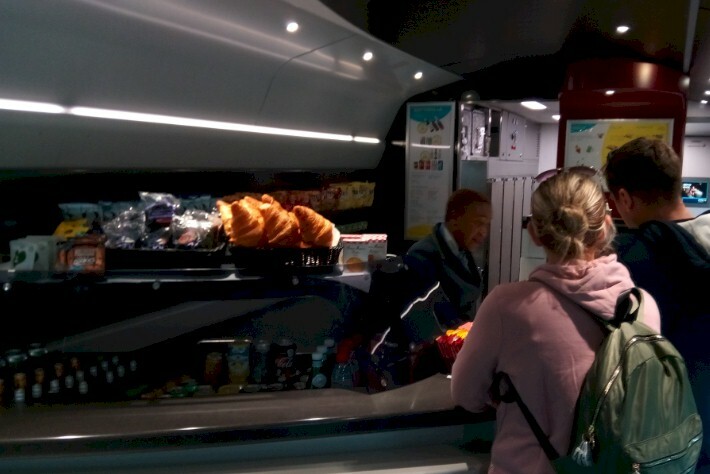 Standard Class passengers purchase food here in the cafe car - we loved the French rolls! Traveling at speeds of almost 300 kilometers per hour (or over 180 miles per hour), you reach the Chunnel just about 30 minutes after leaving London! 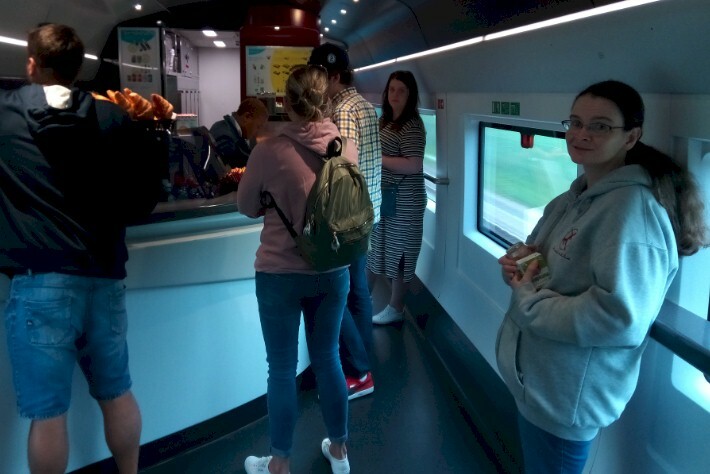 We got up to use the bathroom and check out the cafe car -- and by the time we got back to our seats it was almost time to go through the Chunnel. And even though the train slows down for safety reasons in the Chunnel, you are only underground for about 20 minutes. That means you are in France less than one hour after leaving London believe it or not! 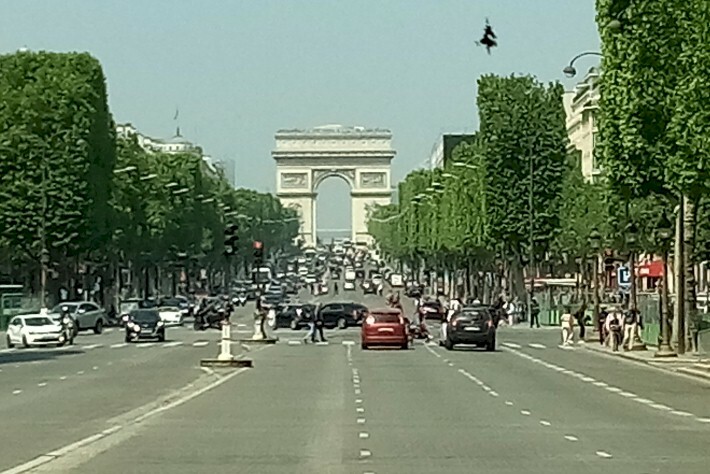 The remainder of your 1 hour and 15 minute journey after leaving the Chunnel is through very rural regions of France before the suburbs and cityscape of Paris begin closing in... and you arrive at the Gare du Nord Station. Welcome to Paris! 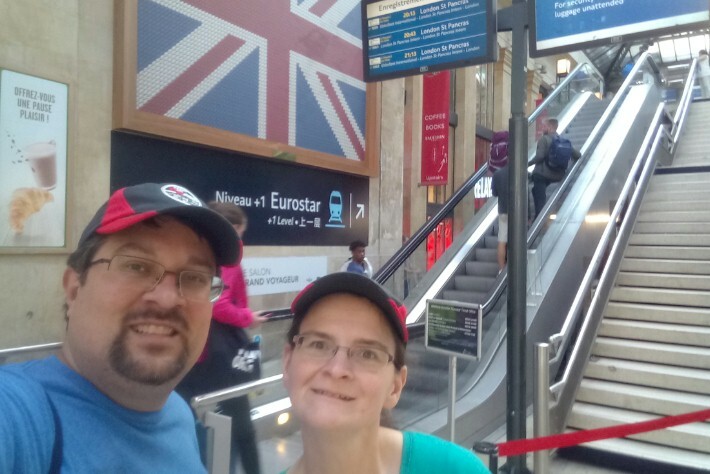 Robert and Kandace capture the moment getting off the train in France for the first time. 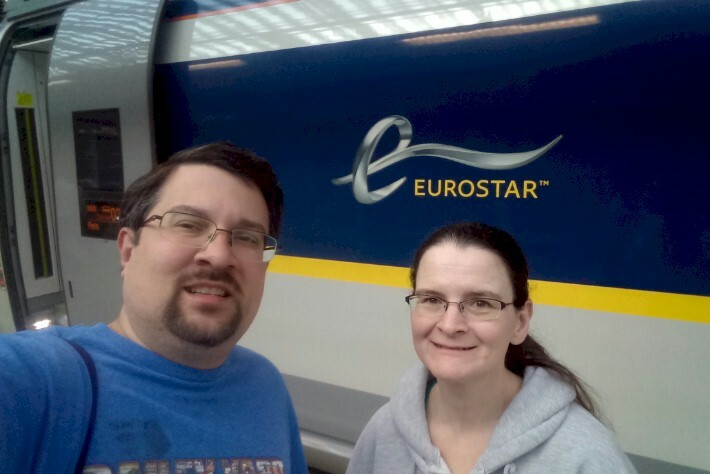 Thanks Eurostar for the awesome and fast ride from London! It was almost not enough time on the train for us! 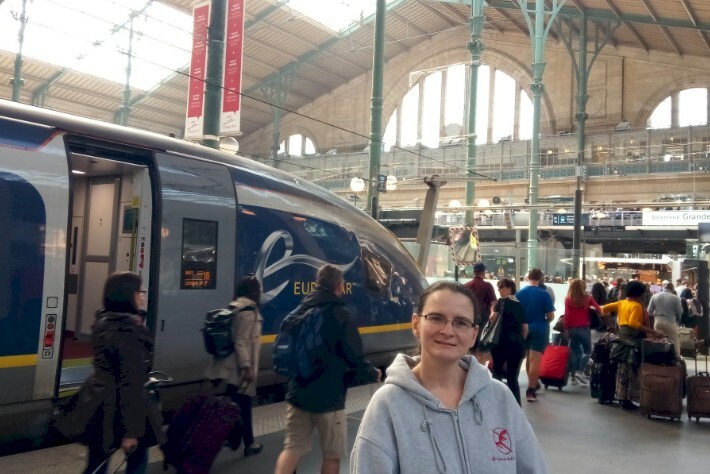 Our train arrives in Paris! Our Eurostar train arrived in Paris right on time at 11:47am. Note there is a one hour time change ahead between London and Paris -- so the 11:47am arrival in Paris was really at 10:47am London time. The time change works nicely in your favor going back to England though. 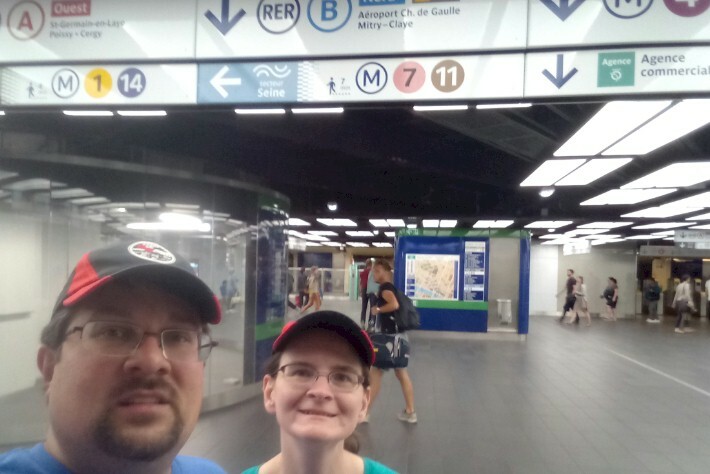 We decided for a little adventure to try and use Paris' public bus system to get between the train station and the Eiffel Tower (note: the two locations are NOT really that close to one another!). This was the only point in our whole trip we did get a little turned around -- mainly because so many streets did not have signs -- and because there were so many small streets off every traffic circle around the station. It also turns out the weekend we were there the bus was not stopping right at the train station due to construction and we had to walk to the first stop down the line. Hopefully you won't have any of these issues. After about 10 minutes we were able to get our bearings. Hopefully the maps we threw in below will help you too if you decided to re-trace our trip. 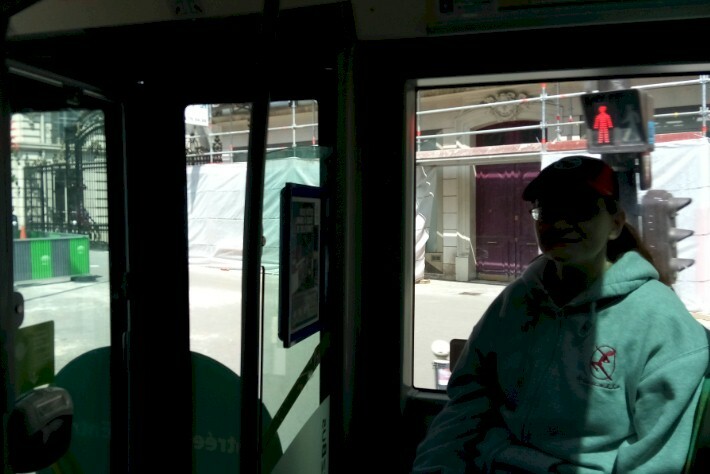 Basically, the #42 bus will be your best friend; it runs from right outside the station to just a few blocks from the Eiffel Tower and costs around $3. Why pay an expensive taxi or some other service? Plus, you get to rub elbows and traveling like the French do! Even with getting a little turned around, we made it to the Eiffel Tower bus stop (about three or four blocks away from the tower) by 1:00pm. 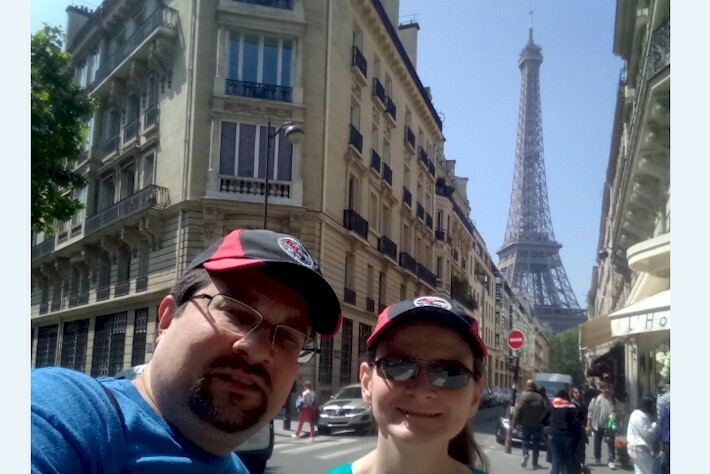 Our tour time was at 3:00pm, which allowed us to do some souvenir shopping and enjoy a nice leisurely lunch at one of the many sidewalk cafes that you pass between the bus stop and the Tower itself. Following that, we went through security (you get expedited security and don't have to stand in the long line made up of people who don't have advance tickets) and waited in the area under the tower until our 3:00pm tour time came. 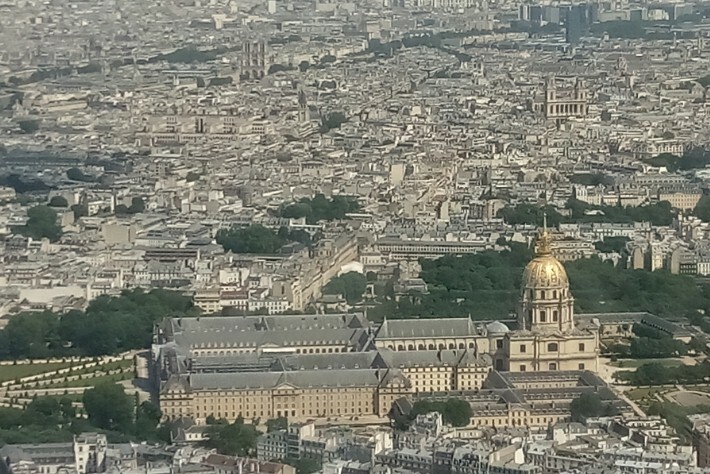 From there, we made our way up to the top of the tower for some sweeping views of Paris. As we noted earlier, expect at least one hour in line still even with the timed tickets on a crowded day. We didn't get up to the top until around 4:15pm and didn't leave the Eiffel Tower area until 5:00pm. You gotta do what the sign says, right? 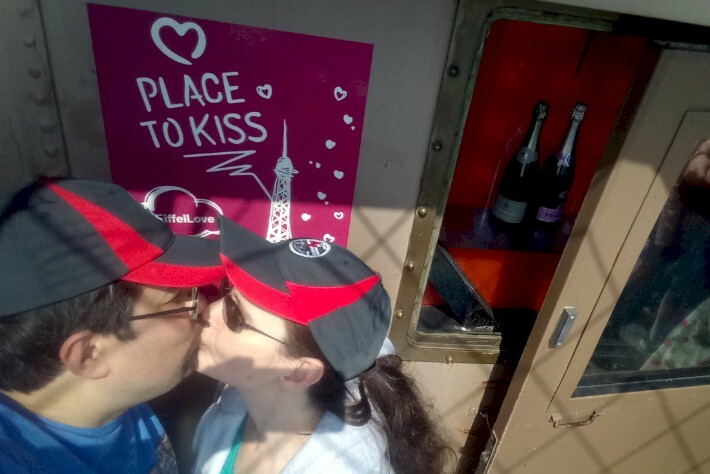 While I think we are both glad we did the Eiffel Tower during our time in Paris because it's so iconic, and I doubt we are going to get back anytime soon... but wow... the unusually hot weather and the heavy crowds definitely dampened our enthusiasm a bit for the visit. 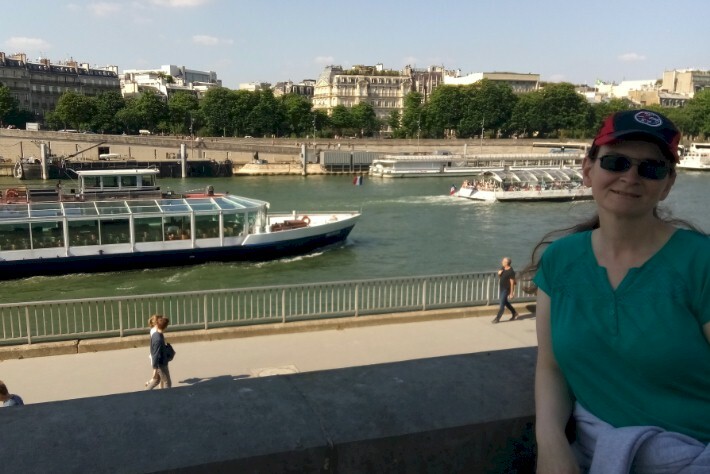 Since we still had several hours before our train back to London left... we decided to take a leisurely stroll along the Seine River for as long as we could. Some French fashion magazine was doing a photo shoot along the river, too! 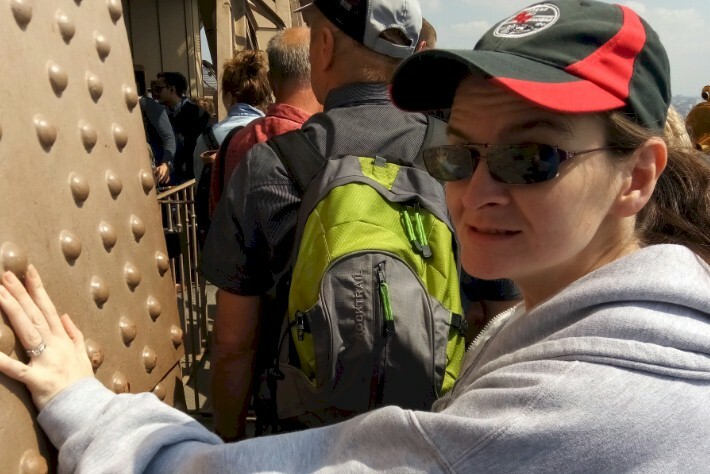 The Pont des Arts Bridge in Paris is famous for lovers putting their names on a lock -- locking it on the bridge -- and throwing the keys away in the river... legends has it this seals your love forever if you do this! Yes, for $5 we gave it a try. Who says Robert can't cook? 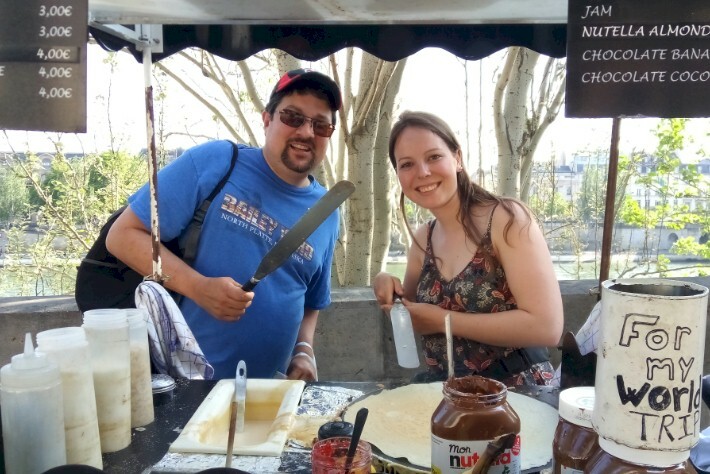 Here he is with his new French friend frying up some Nutella crapes for dinner. We walked several miles along the river... here is one last view of the Seine River before heading back to the station. 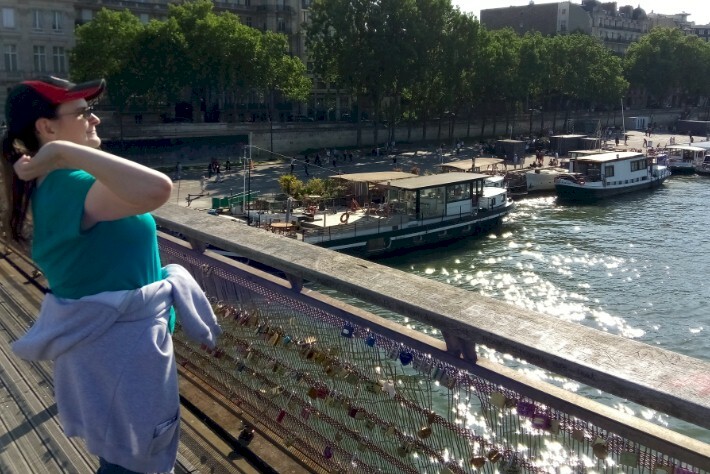 We enjoyed our 'quiet time' together walking along the Seine River back to the station as much, if not more so, than our visit to the Eiffel Tower. 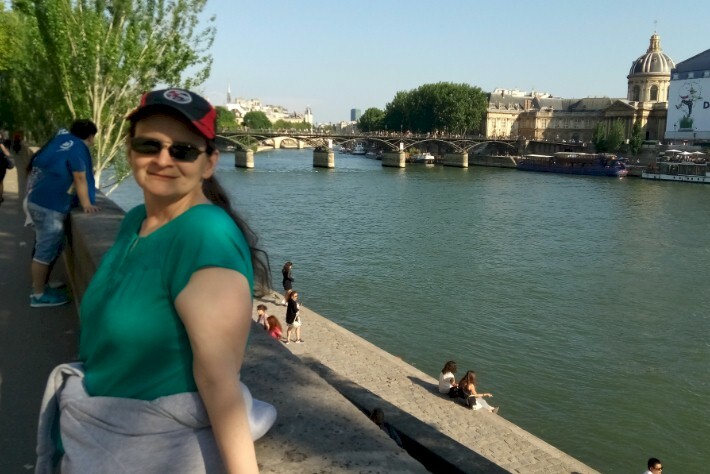 It was nice to get away from all of the crowds and just enjoy the beauty of the walk along the river... we would highly recommend doing this if you do the day-trip to Paris on the Eurostar from London. 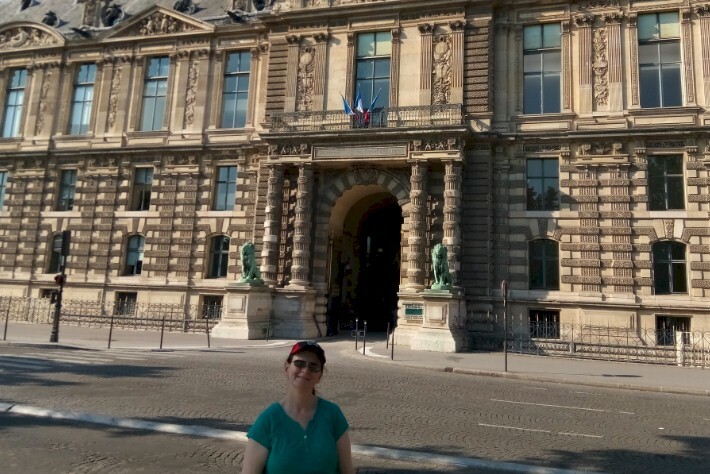 In order to experience at least a taste of the Paris Subway System, we walked to the Ch�telet–Les Halles Station and rode one stop northbound back to the Gare du Nord Station. 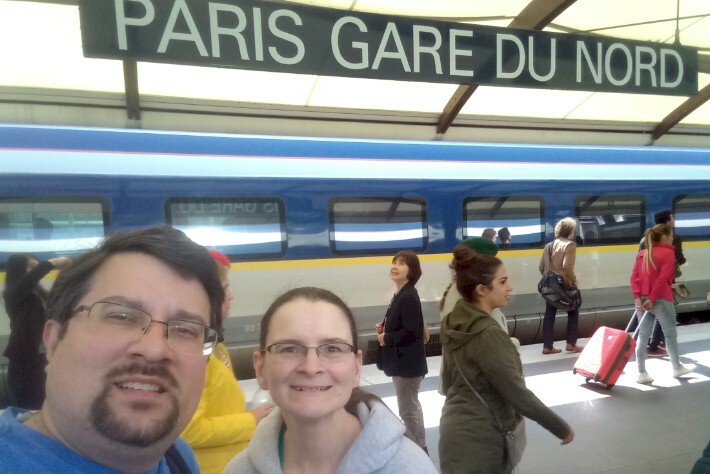 After riding just one stop, we found ourselves back at the Gare du Nord Station. Once again, we arrived almost too early at the station... but we didn't know what to expect with security lines. This did allows us to stock up on some more souvenirs and French chocolates and other goodies to bring back with us. 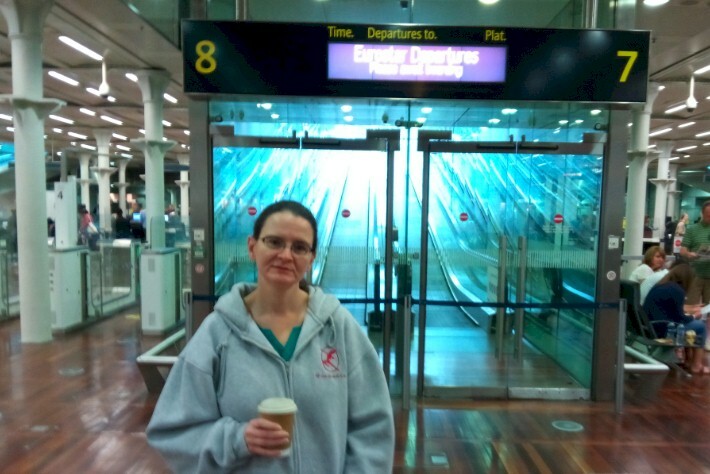 Security was just about as easy to get through at the Paris Eurostar station as it was in London. Once again, you are pre-cleared at the station by U.K. border agents, meaning once the train arrives in London, you are free to get off and go about your business without having to be interviewed. 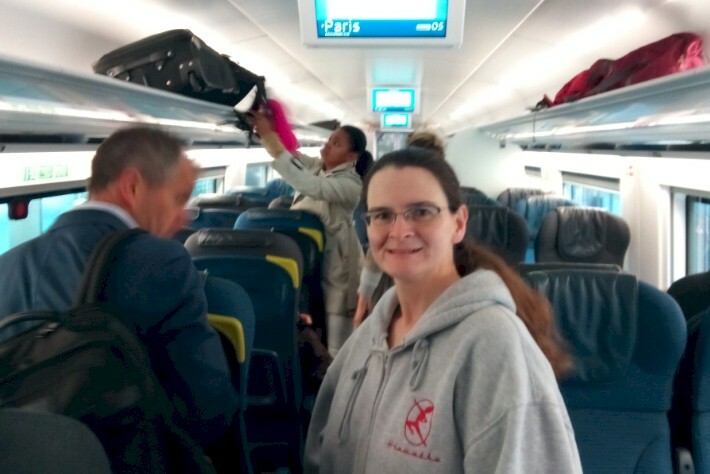 We decided to do the upgrade to Standard Premier for the return journey to London... especially since we knew we were going to have a long day in Paris and a lot of walking to do. 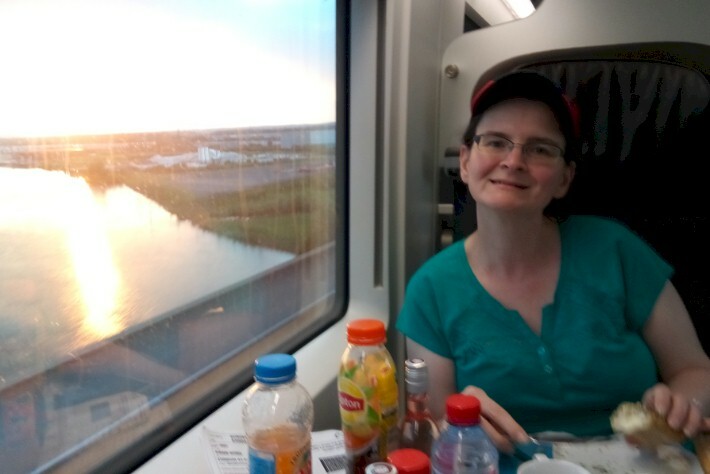 You get a light meal and the seating, in parts, is 1-by-1, which meant we were both able to get a window seat to watch the sunset over the French countryside. It was amazing. 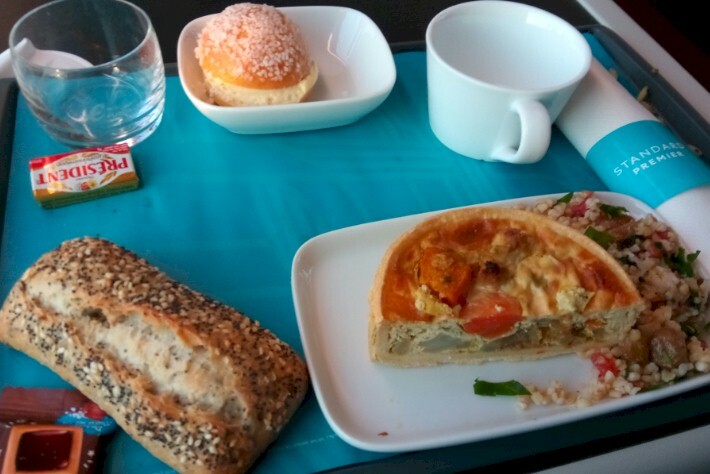 By the way... the food was delicious and the service on our train was amazing. I was surprised that more people didn't upgrade to Standard Premier. It is DEFINITELY worth the money in my opinion. And even though we are glad we got to experience both classes of service, we were sort of kicking ourselves for not doing the upgrade on the outbound. 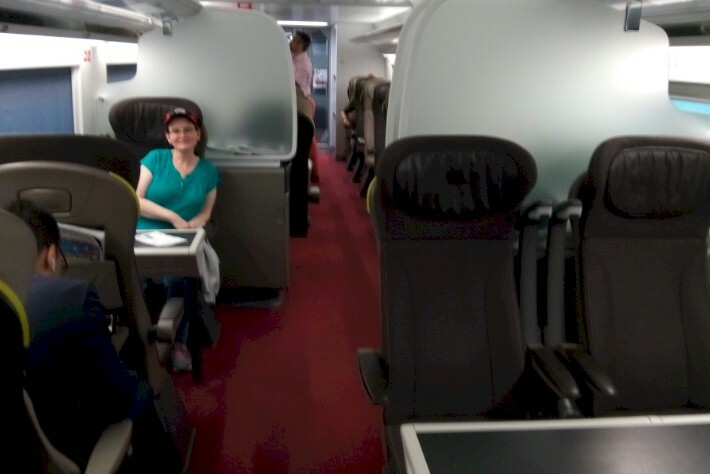 If/when we travel Eurostar again, we will only go Standard Premier. 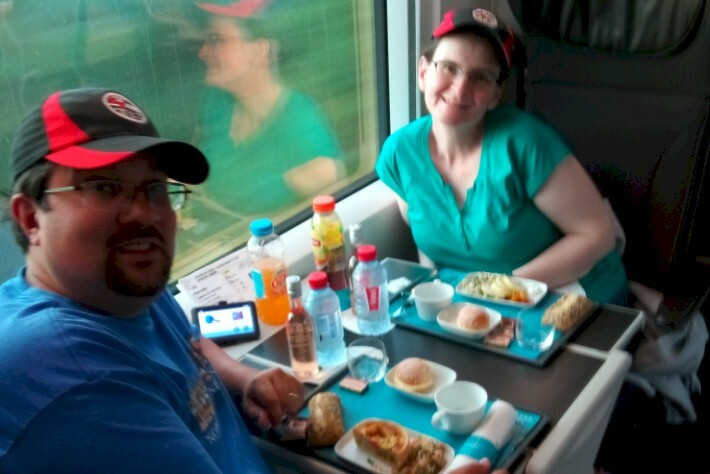 Robert and Kandace enjoy dinner on the Eurostar - Standard Premier gives both people a window seat! Our wonderful dinner on the Eurostar! Finally, If you enjoyed our writing, we would also encourage you to check out the 11 "Outside the Rails" railroad route guidebooks that we published for the various Amtrak passenger rail routes through the Upper Midwest. They are available on our website, www.MidwestRails.com. Our new e-book versions and train guide podcasts are also available here. We also feature the guidebooks written by Eva Hoffman for various Amtrak railroad lines in the west and east!